Discussion in 'Teaching overseas' started by qualiteacher, Jan 31, 2019. Hello All, I was wondering if schools that have the word British in the title have to be registered as a company in the UK? 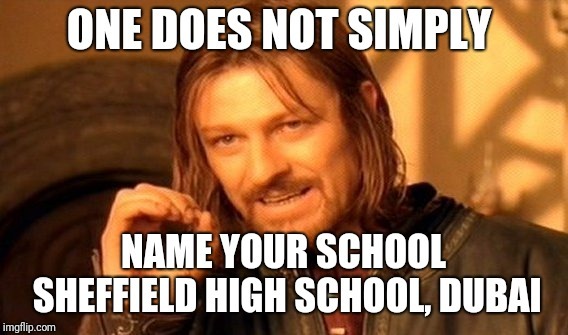 Or can anyone call their school British? Having taught in international schools for the last twenty years, qualiteacher, I would say that the word "British" might mean all kinds of things (or not very much). No, I do not think that it is true to say that there are lots of schools in Egypt or China or anywhere else that have the word "British" in their title because they are registered as companies in the UK. I think this is most unlikely, but I might be mistaken. When I was teaching in Qatar, there was a school that called itself "the Cambridge English School". This title did not guarantee that all of the teachers at that institution were Cambridge graduates or that all of the students were English. Anyone can, and many do, call themselves 'British', what it usually means is that they try and offer a British style curriculum. How much they offer also varies. Some follow the national crriculum with some tweaking; i.e. a modfied KS3, some offer IGCSEs and A levels while others offer the IBDP. You will notice I am only speaking about Secondary as Primary is another country as far as I am concerned. I am sure a certain weightlifer will be along in a minute to tell you that all british schools are bad and all IB World schools are great but they are all a mxed bag these days. Do your research and make your own mind up. I have worked in good and bad of both types! I'm pretty sure this isn't a rule. I mean, how would it be enforced? There are associations of “British” schools, but, in my experience, the name doesn’t mean much and the gap between the best and the worst it HUGE. I’m pretty sure there’s no rule about being a registered company anywhere. Thanks for your replies everyone. I am trying to find out because my ex works in a ‘British’ school. He moved abroad to avoid paying child maintenance. If the company was registered in the UK then Child Maintenance could get involved. Moving overseas in order to avoid paying child maintenance is a dreadful thing to do. (It's probably illegal as well.) That is not the sort of colleague that I would want to have. I would ring up the headteacher of this British school (wherever it is) and ask directly why he or she has given a teaching post to such a *******. How can your ex be trusted to teach other people's children if he won't even look after his own? I am sorry for my original post, qualiteacher, as I had the wrong end of the stick, as usual. ed717 and ejclibrarian like this. Thanks, Hippo! My thoughts exactly. The answer to your problem is to attack your ex-partners PASSPORT. Keep up your court actions against your ex-partner and make sure court sits even when your is absent. After a few court actions for none payment and your ex-partner does not show for a court appearance ask the judge to issue a court/bench warrant. Basically if your ex does not appear to a court appearance with a bench warrant against them you maybe able to ask the court to suspend their passport. Failure to appear before the Bench after a warrant has been issued is a criminal offence and an arrest warrant then can be issued. Your ex will not be able to renew their passport if it expires! ed717 and mermy like this. I can't see how this is going to help the OP to get her ex to pay child maintenance. If anything, it will only escalate the situation. Perhaps you are right, kemevez. I did actually phone the school to ask if they were registered in the UK and they were pretty rude to me. They called me weird and refused to give me a clear answer. I guess my ex had prepped them. Certainly would never want to work at this school! As I outlined the only way to put pressure on your ex is to continue the court action and then attack their passport. Without a out a valid passport your ex can not renew and continue working in a foreign country. This is a standard course of action now for absentee parents. But i would avoid working in a foreign country where women are treated as 4th class animals and your ex could grab your children legally from you. Hello All, I was wondering if schools that have the word British in the title have to be registered as a company in the UK? what authority do you imagine could possibly impose such a rule or enforce it? or why? he's left his job and home and friends and family and country to avoid paying maintenance? Maybe he just wanted to go abroad, I can't imagine someone putting themselves into exile for this! I'm guessing they happen not to want to pay, and also happen to want to work abroad. I am sorry to say living outside of the UK to avoid the family courts, alimony and child support is very common. I know of one couple who adopted 2 children in an Asian country(according to that countries laws) to be told the children will be taken into care by UK social services if they ever set foot in Britain as the woman was over 45yr old. I also know a man working abroad to avoid paying child support in the UK. To balance this out I know a woman working abroad to deny her ex access rights to the children even though the ex was paying child support.